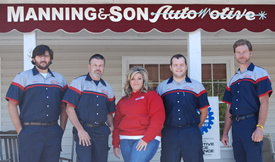 This family owned and operated auto repair business was established in June of 1988 by a father and son team, Dorsey & Michael Manning. After Michael returned home from his service with the Marines the thought came to mind to create a business as a father and son team and thus Manning and Son was born. During the years in the car repair business they enjoyed working with each other side by side. If you knew Dorsey Manning, he was a real people person and always did a good job at "making the customer happy". For the past 25 years, Manning and Son has always been active in helping the community around them by sponsoring soccer teams and various high school athletic programs, church fundraiser's, Policeman's Fund, and much more. Since the passing of Dorsey Manning in July of 2003, we will miss him tremendously, but find comfort in knowing he is with us in spirit as we move forward to serve our new customers with the same kind of expert care and satisfaction as our existing customers and friends have come to enjoy and expect. We look forward to taking care of all of your automotive repair needs.